Imagine an America in which the visual arts take their rightful place as an economic force in the massive arts and entertainment industry. With the consequent five-fold increase in market size (and growing! ), there is a quintupling of cultural impact. When culture warriors try to shove artistic exploration back into a bottle, myriad voices proclaim the centrality of art's freedom-loving pluralism to American values. When special interests try to restrict public access to creative assets, an army of enthusiasts demonstrate the importance of balancing private rewards for the hard work of innovation (and interesting derivation!) with spreading the benefits of culture for the greatest good. Americans treasure the role that visual arts play in their lives, and reward the workforce of artists who provide the experience. Art participation is tied directly to artist appreciation, because the public is repeatedly reminded about creators of the work, not only by celebrity appearances, but by artist signatures on every wall. Art marketing that introduces the artists behind the art is as ubiquitous as advertising, with insightful explanations and demonstrations of artistic goals, methods, and biographies. A young person wanting to become an artist is no longer a parent's worst nightmare, but rather, brings to mind numerous lifestyle choices and career opportunities that are both viable and enviable. Artists are everywhere: teaching in schools, invigorating workplaces, exciting our homes, planning waterfronts, challenging television viewers, revitalizing coffee-shops, even running for public office [PLATE 100]. Fighting for the arts is no longer seen as a partisan interest. Conservatives and liberals loudly champion their diverse artistic interests. The mix of art and politics no longer just means learning which movie star favors which cause, nor still having to demolish the restrictions and biases of the past. Art has become integral to diplomacy, with cultural exchanges facilitating international relations and diminishing conflict throughout the world. American governmental entities at all levels fund a vast variety of artistic endeavors that are integrated into all aspects of American life, from local economic development to national education policy to significant public spaces. These investments are more than matched by all manner of private-sector contributors with specific and general interests in the outcomes. In sheer financial terms, the art market's biggest changes have taken place in the private sector. The for-profit visual art industry is one of the leading innovators in intellectual property, new media, retailing, and finance. A new generation of corporations has emerged, as well as innovative visual arts divisions of existing corporate entities. Artists engage in a range of commercial relations with companies and consumers [PLATE 101]. Like musicians who receive contracts for live performances and royalties from record sales, visual artists have developed different arrangements for exhibiting and selling original work, and distributing reproductions for mass consumption. Contemporary art has become as prevalent in the marketplace as Sanrio's "Hello Kitty" was at the start of the century. Creativity has become America's brand name, and artists are the recognized experts, consulting for organizations in all sectors of the economy. Government decision-makers who need measures of accountability to justify their actions to voters understand that cultural investments are not merely unquantifiable aspirations or politically controversial aesthetics. Rather, politicians and bureaucrats are well aware that areas of legislation and budgeting involving the arts and all other forms of intellectual property are critical to all aspects of economic performance, from local community development to international competitiveness. Federal tax deductions for charitable donations of art, which had been the hidden driver of escalating art prices and the growth of non-profit arts (the largest source of museum income and equal in value to the entire on-the-books private art market) are finally offered to artists themselves. This ends one of the longest-standing inequities in the arts industry, with origins in the financial shenanigans of cash-strapped European aristocrats and the noblesse oblige of Post-War American industrialists, and led to the formation of the Art Dealers Association of America and IRS-backed appraisal standards. Previously, unlike everyone else who donates art, artists were only allowed to deduct the generally worthless tax value of materials and supplies. Opposition to resale royalties for artists also finally gave way, many years after the European Union had agreed in 2001 to harmonize standards of droit du suit (rights of resale). Non-profit arts have been transformed from the ground up. Starting with educational institutions, the arts have been thoroughly integrated into the curriculum after years of corroborating evidence that the skills, confidence, and thinking strategies developed through artistic expression help with the basics of reading, writing, and arithmetic—not to mention test scores, readiness to work, technological innovation, teamwork, and positive attitudes about life in general. Undergraduate and graduate art schools, in turn, integrated their curricula with other areas of programming throughout the educational community. The expansion includes a range of fields relevant to professional development beyond the craft and thought needed for exceptional artistry. As a result, when artists enter the workforce, they are broadly trained in how to market and apply their abilities both within and outside of the traditional world of art galleries and alternative exhibition spaces. In particular, artists understand that that shunning reproduction means forfeiting two-thirds of the potential income from their work. Despite meteoric growth in demand for original work by hot contemporary artists, sales of reproductions continue to accelerate even faster, just as they had during the prior century. Not-for-profit arts organizations have adapted their missions and staked out new territories to catalyze and accommodate growing and more sophisticated demand. Like the rest of the non-profit community, they have aggressively and creatively diversified their income sources, applying their core competencies to commercial alliances and community services in ways previously unimagined. They internalized the results of the Urban Institute's turn-of-the-century report on artist working conditions, and focus their activities not only on showing the most innovative artwork, but also on building much-needed artist infrastructures and expanding the markets for art and art making. Twenty-First Century social enterprises such as Boston-based Leveraging Investments in Creativity and New York-Based Mutual Art, working in alliance with both fledgling and established organizations around the country, have pioneered artist pension and medical insurance plans, artist live-work real-estate developments, artist employment and grant information systems, international cultural exchanges, and even creative retirement homes. The earlier entrepreneurial influence of museum stores (especially their positive impact on institutional growth and survival) has spread to all non-profit arts organizations in diverse and unexpected ways. The cornucopia of new financial arrangements for putting art out into the world include leases, loans, licensing, consignments, merchandizing, sharing, bartering, and too many other forms of transaction to mention. The standard organizational model has changed from how to get audiences through the doors, to how to get artistic experiences into all aspects of life, work, play, and community. As a result, cutting-edge contemporary art is seen everywhere, and artists are getting paid for the privilege. Universities and other large institutions, as well as small, medium and large businesses in all sectors of the economy routinely budget for and pay artists and their agents to provide and install works for exhibition. Artists not only receive shares of the proceeds from their shows, they also earn royalties from a variety of uses of their original and reproduced art, as well as fees for creative work in a wide range of academic, corporate, government, and social-service settings. National artistic professional development agencies such as Creative Capital not only recruit corporate strategists to train emerging artists in the skills of success, but they are also placing exceptional artists in board rooms to inspire creativity. The innovations of avant garde creative artists and non-profit arts organizations are models for culture workers and professionals in numerous other fields, who, like artists, often work independently for multiple employers, solving problems and providing value based on talent, experience, and training. There are bold new non-profits involved in strategic arts advocacy. After receiving an unprecedented $120 million gift from billionaire pharmaceutical heiress Ruth Lilly in 2002, the Washington-based Americans for the Arts finally achieves its goal of becoming a household name, claiming its ground as the "Sierra Club for the arts." With more museum goers than outdoor recreation enthusiasts, Americans see a proliferation of arts advocacy groups that are as well recognized for grassroots and international activism, lobbying, litigation, and research as the constellation of famous environmental groups that existed at the start of the century, including the arts equivalents of Greenpeace, National Wildlife Federation, Earthfirst!, World Wildlife Fund, Audubon Society, Nature Conservancy, Environmental Defense, Natural Resources Defense Council, and so on. The arts advance all of the media strategies that environmental organizations had so successfully developed in the past, from children's Ranger Rick magazines to Rainbow Warrior's daring at-sea protests. Visual artists have established the largest arts union in the country to set a range of industry standards, negotiate fair compensation, and join in a variety of advocacy and lobbying efforts. These pioneering arts advocacy organizations achieve tremendously influential synergistic effects by collaborating with non-profits working in diverse areas, including, for example, environmental groups and information activists. The resulting heightened level of civic engagement leads millions of Americans to actively support a new kind of cultural environmentalism that expands our creative commons. Artists understand their role as "cultural citizens" (to use the phrase of Theater Communications Group director Dan Cameron) is critical not only for their own livelihoods, but for protecting and nourishing American culture at large. For the first time in decades, multi-disciplinary public intellectuals abound, spurred by the blogging bonanza that began the century. The art world no longer resembles the anemic state that led to the classic economic formulation of William J. Baumol and William G. Bowen, who saw the fine arts as suffering from a "cost disease," unable to incorporate the labor-saving technological advances needed for financial viability. This seminal hypothesis launched the field of cultural economics, and concluded that government subsidies and private donations were the only means by which the arts could survive in a cut-throat capitalist world. Not even mass media would cure the affliction. As it turns out, the exact opposite was the case, fine artists are showing the rest of society how to reorient the economy towards sustainable creative ends, and are deploying the most advanced technologies for transforming contemporary culture. As Joseph Beuys put it in 1985: "the two genuine economic values involve the connection between ability (creativity) and product. That explains the expanded concept of art: ART=CAPITAL." [PLATE 102] At its core, the symbolic capital generated by the arts is infinitely reproducible. No one thinks deprivation helps creativity any more; the myth of the starving artist has become a distant memory. Individualism and overexposure, the other specters of the self-imposed mythical triumvirate that had kept visual artists from engaging the broader public, have also been dumped from their thrones as leading preoccupations of working artists. Reproduction in the visual arts is seen as a profound social process, not a second-rate product. Procreation. duplication, repetition, imitation, simulation, replication, copies, parody, simulacra, cloning—these are the seeds of artistic evolution and expansion that have led to the new renaissance. Artistic innovation has reached exponential rates and its impact on society at large has become truly transformative. Communication, difference, freedom, truth, justice, beauty, suffering, humor, subversion, mystery, awe—there is no end to the traditional and novel motivations expressed in the work of the ever growing numbers of visual artists. They are the indeed the avant garde of the creative society, and the public is following their lead. Artists of the world: MULTIPLY! 1. 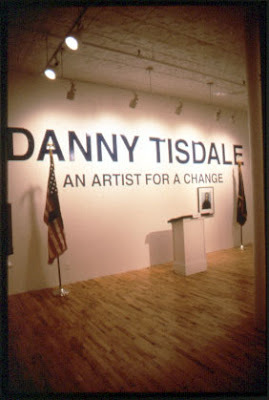 Danny Tisdale. An Artist for a Change in New York City. 1996. 2. Bill Watterson. Calvin and Hobbes. 1990. Courtesy of Universal Press Syndicate. http://www.law.harvard.edu/faculty/martin/art_law/market.html (Accessed: February 8, 2005). 3. Joseph Beuys. 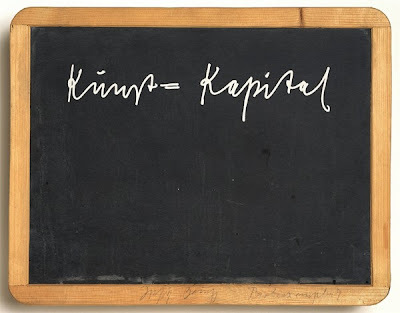 Kunst = Kapital (Art = Capital). 1980. Screenprint on blackboard, wood. Courtesy of Walker Art Center, Minneapolis. http://www.denison.edu/library/class/ARTH284-sperling.html (Accessed: February 9, 2005). Fullterton 1991; National Endowment for the Arts 2004, p 2.